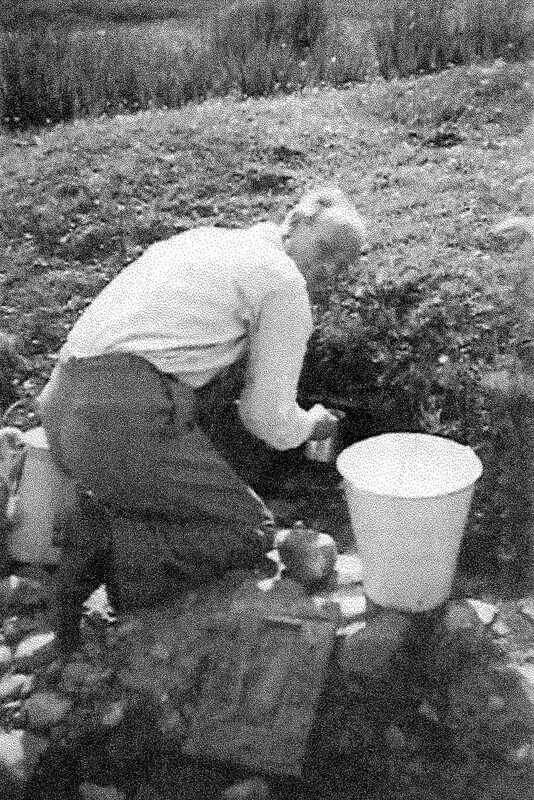 Black & white photograph of Hugh Fullarton, son of Annie Cameron, Balevullin (ca 1880-1965), collecting water from the well on the other side of the bridge from Annie’s house in around 1965. 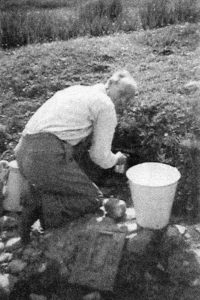 The well was the water supply for the house. 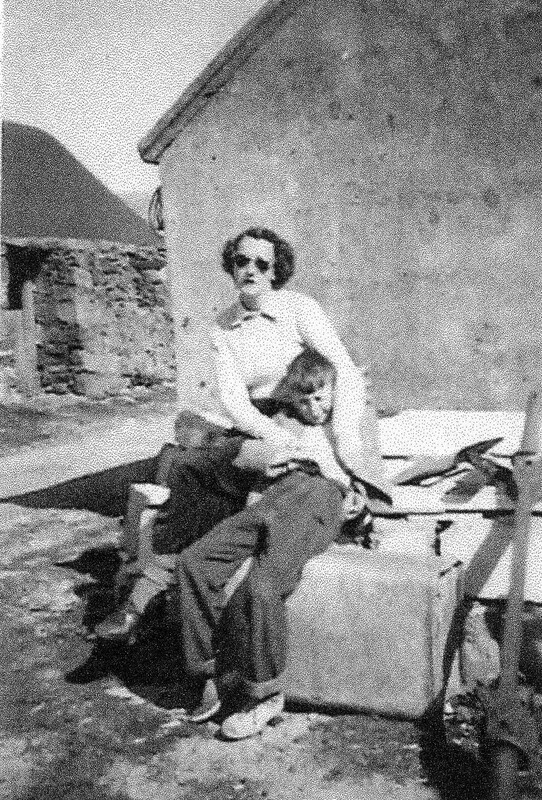 It is no longer visible. 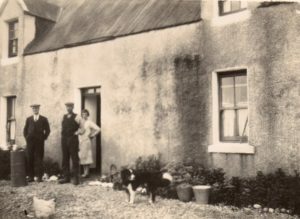 Collection of 11 photographs (printed from pdf files) of the house and family of Annie Cameron, Balevullin (ca 1880-1965), and information from her grandson emailed in 2018. 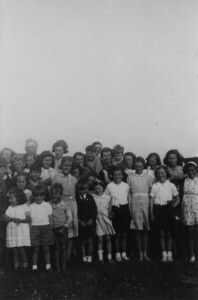 Three photos are catalogued separately under 2019.32.2 to 2019.32.4. 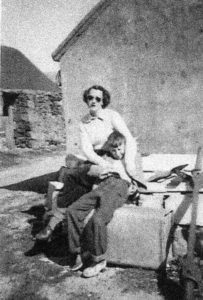 Black and white photograph of an unidentified couple outside their house at Balevullin, with one other person, in around 1960. 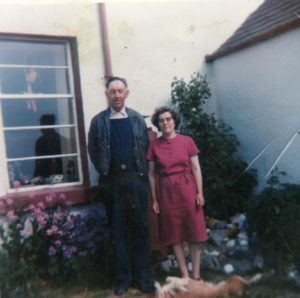 Colour photograph of Donald MacLean and Cathie Maclean from Ardbeg, Cornaig, at Balevullin in June 1970. 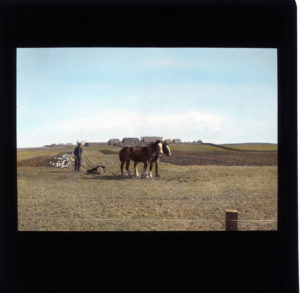 Coloured photograph of ‘Ploughing at Balevullin, Tiree’’, 1941-43, taken by archaeologist George Holleyman FSA when he was stationed at RAF Tiree during WWII. Scanned from one of his hand-coloured glass lantern slides now held at An Iodhlann (see 2017.54.4). 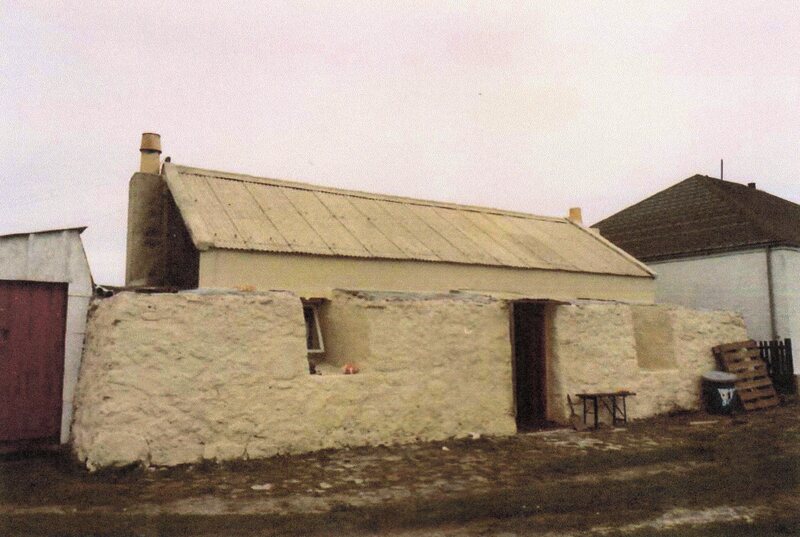 Coloured photograph of ‘Bella Mhate’s [Isabella MacLean] tigh tugha (tame sheep near door)’, at Balevullin(?) 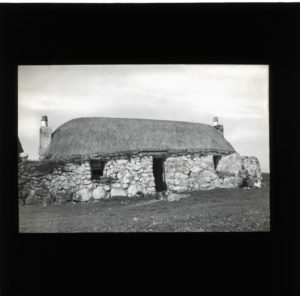 1941-43, taken by archaeologist George Holleyman FSA when he was stationed at RAF Tiree during WWII. 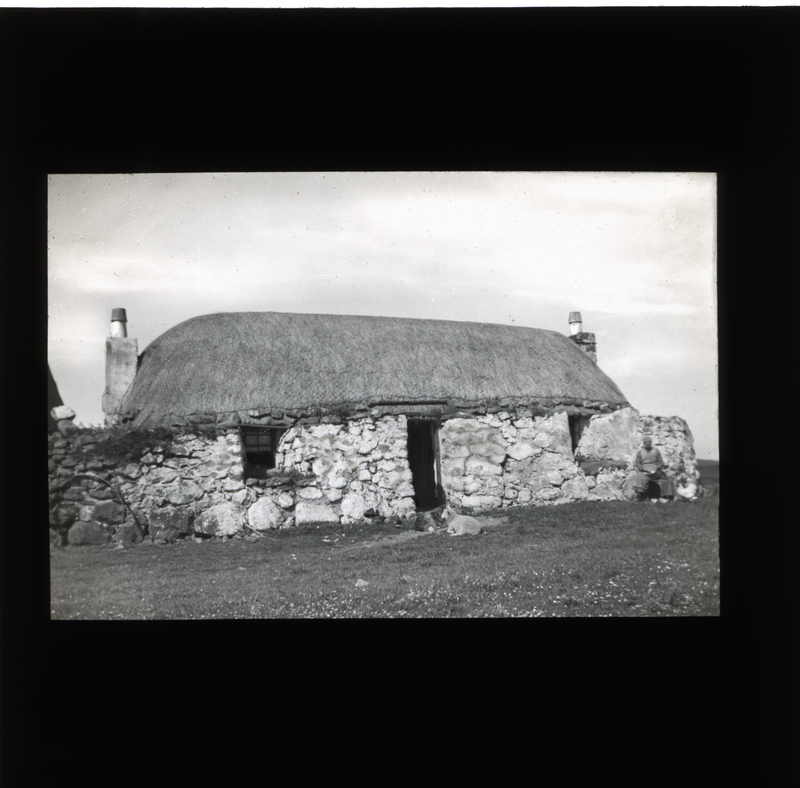 Scanned from one of his glass lantern slides now held at An Iodhlann (see 2017.54.4). Coloured photograph of ‘Farmstead at Balevullin, Tiree’, 1941-43, taken by archaeologist George Holleyman FSA when he was stationed at RAF Tiree during WWII. 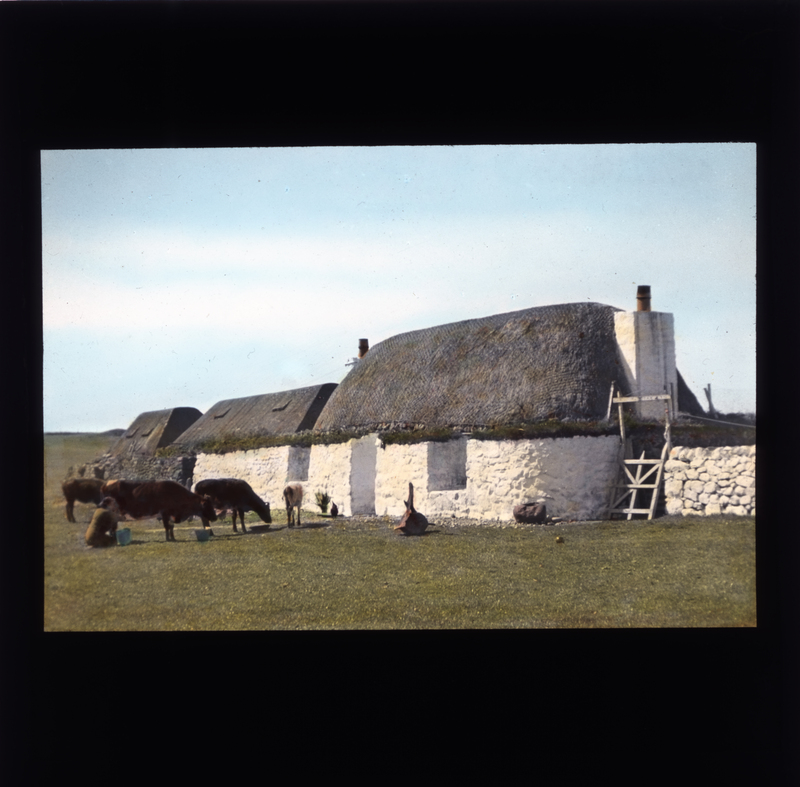 Scanned from one of his hand-coloured glass lantern slides now held at An Iodhlann (see 2017.54.4). Black & white photograph of James Galbraith (seated with beard) and family outside his thatched house at Balevullin in around 1890. 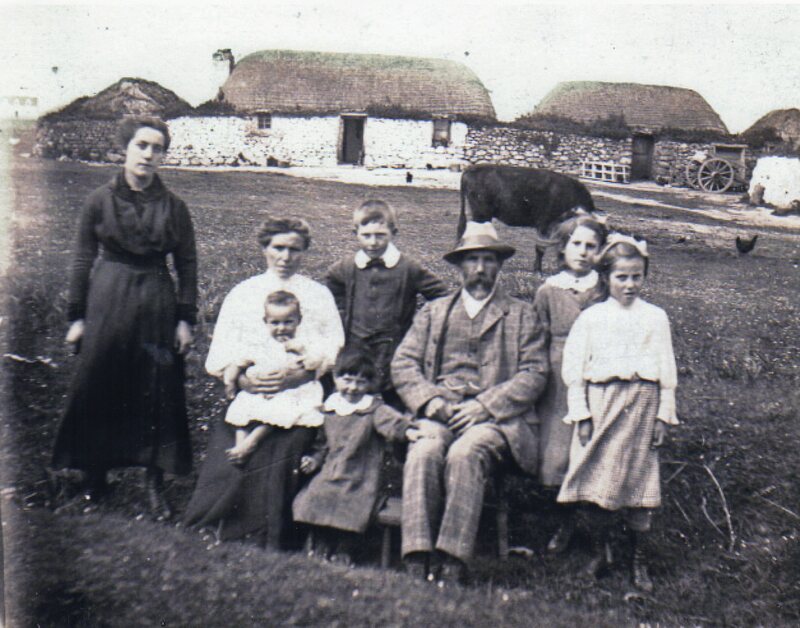 Standing – daughter Janet Galbraith (later MacDonald, Kilmoluaig); seated – daughter Sarah Donald (nee Galbraith) with baby Dorothy on her lap, and her other children Charlie, Jessie and Margaret. 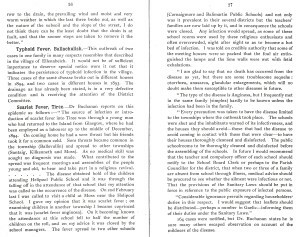 Sarah and her family lived in Glasgow and were probably paying a summer visit. 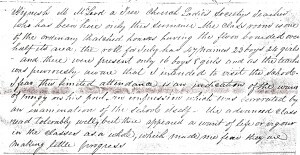 James Galbraith (1821-1903) was born in Gigha, and came to Tiree from Rothiemurchus, near Aviemore, with his wife and children in 1874 to take up the position of School Master of the Parochial School at Balevullin. 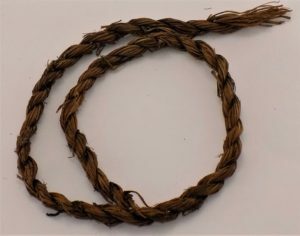 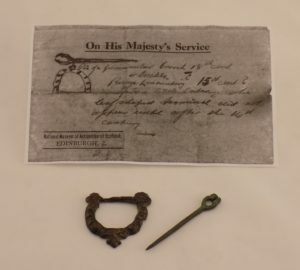 He was given the croft at Balevullin as part of his payment.